Bluegrass quintet Five in the Chamber play Best Video Performance Space on Friday, July 13. The show starts at 8 PM and the cover is $5. Five in the Chamber is Ken McEwen (Guitar, Vocals), Pete Kaufman (Banjo), Kat Wallace (Fiddle, Vocals), Dave Casali (Bass, Vocals) and David Sasso (Mandolin, Vocals). UPDATE: Fri., Jan. 13. Due to circumstances beyond their control Five in the Chamber will perform as a trio tonight of guitar, banjo and mandolin. 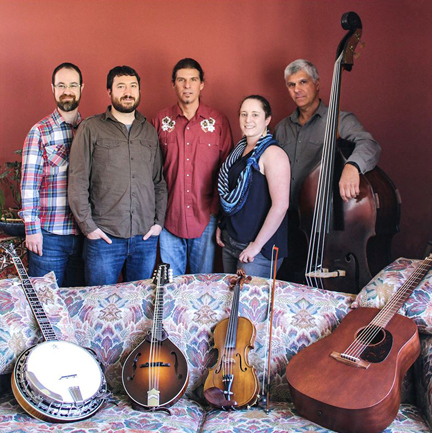 Bluegrass quintet Five in the Chamber play Best Video Performance Space on Friday, Jan. 13. The show starts at 8 PM and the cover is $5. 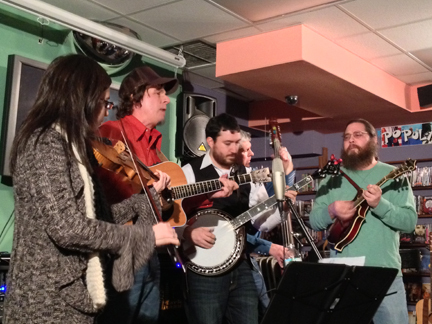 Five in the Chamber is Ken McEwen (Guitar, Vocals), Pete Kaufman (Banjo), Alexandria Marino (Fiddle, Vocals), Dave Casali (Bass, Vocals) and David Sasso (Mandolin, Vocals). Five in the Chamber play the Best Video Performance Space on Thursday, Dec. 12. The music starts at 8 PM and the cover is $5. 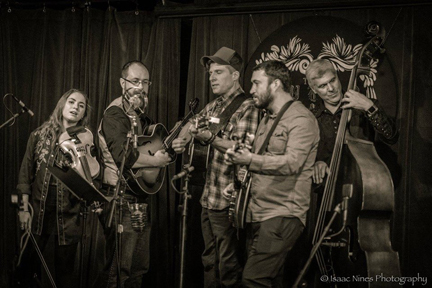 Five in the Chamber is a New Haven, CT-based rollicking bluegrass and old-time string band with a rocking edge. Brought together through a series of music festivals during the Summer of 2011, the band quickly galvanized and established itself as a staple in the area’s emerging Bluegrass scene. With tight arrangements, unique harmony vocals, and a shared passion for writing original music as well as studying and reinterpreting the bluegrass song book, Five in the Chamber brings a fresh and exciting twist to the bluegrass repertoire. The band released their debut album in the Fall of 2013 entitled Live in the Chamber to rave reviews. 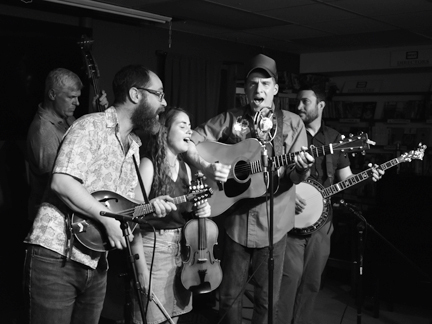 Band members are Ken McEwen (Guitar, Vocals), Andrea Asprelli (Fiddle, Guitar, Vocals), Dave Casali (Bass, Vocals), Pete Kaufman (Banjo) and Sean Mack (Mandolin). Among their influences are Bill Monroe, Flatt & Scruggs, Ralph Stanley, Jimmy Martin, J.D. Crowe and The New South, Del McCoury, John Hartford, Sam Bush, Bela Fleck, Bob Dylan, The Band, Rolling Stones, Grateful Dead, Steve Earle and Gillian Welch. 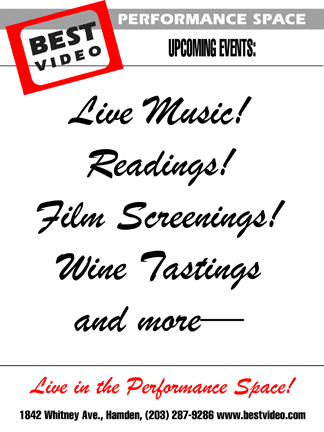 Five in the Chamber play the Best Video Performance Space on Thursday, Feb. 20. The music starts at 8 PM and the cover is $5. 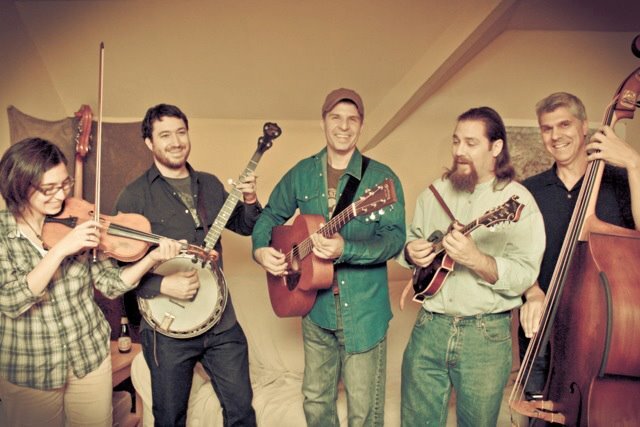 Five in the Chamber is a New Haven, CT based rollicking bluegrass and old-time string band with a rocking edge. Brought together through a series of music festivals during the Summer of 2011, the band quickly galvanized and established itself as a staple in the area’s emerging Bluegrass scene. With tight arrangements, unique harmony vocals, and a shared passion for writing original music as well as studying and reinterpreting the bluegrass song book, Five in the Chamber brings a fresh and exciting twist to the bluegrass repertoire. The band released their debut album in the Fall of 2013 entitled Live in the Chamber to rave reviews.